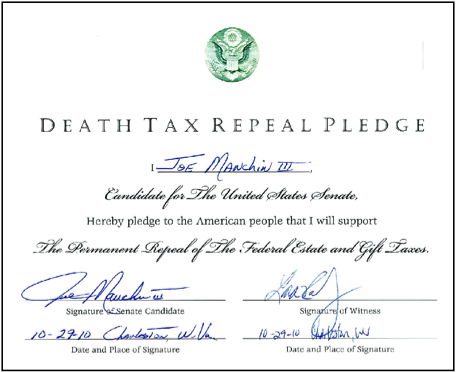 The Death Tax Repeal Pledge has been committing candidates for public office to full and permanent repeal of the death tax for over ten years. 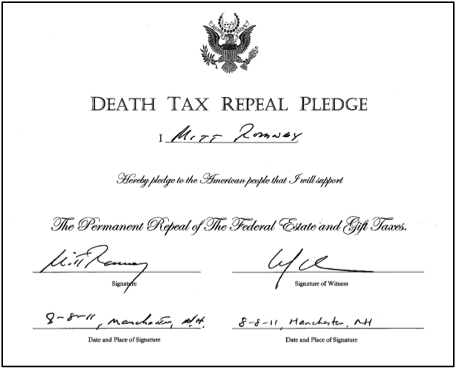 In 2010, an election year that brought in a wave of Republicans to Congress, over 500 candidates and the majority of the incoming freshman representatives signed on to the Death Tax Repeal Pledge. This swell of support quickly translated to the introduction of the Death Tax Repeal Act which has become the main vehicle for repeal in Congress. Congressman Brady (R-TX) and Senator Thune’s (R-SD) Death Tax Repeal Act has achieved a majority of the House as cosponsors for two Congresses in a row. 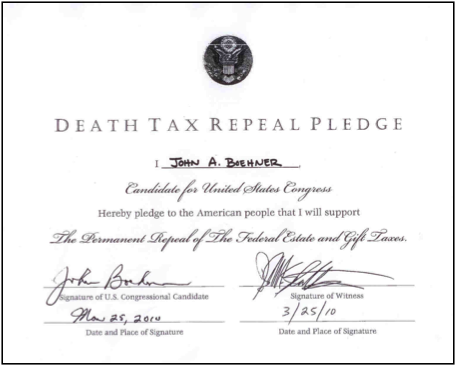 In 2012, nearly every GOP nominee for Congress signed the pledge which helped to make death tax repeal a top-tier issue in public debates. The pledge project attracted significant media attention with the Associated Press, Wall Street Journal, Forbes, and the Hill all covering the project. This year, we will add to our number of signatories in Congress and begin to sign emerging 2016 Presidential candidates. In April of 2015, the Death Tax Repeal Act became the first death tax repeal bill to pass the House of Representatives in over ten years. 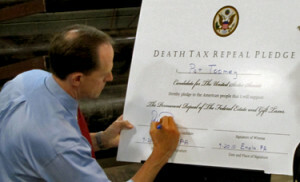 The Death Tax Repeal Act, H.R. 1105, authored by Reps. Kevin Brady (R-TX) and Sanford Bishop’s (D-GA) passed the House with a bipartisan majority. 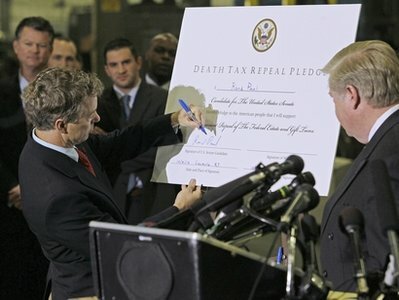 In the 114th Congress over 130 members of the US House of Representatives and Senate have signed the Death Tax Repeal Pledge. Please help us again this year to increase our influence on the policy debate in Congress by signing up even more leaders to kill the death tax. Repealing the death tax would spur job creation, increase wages and grow the economy. According to a 2014 study by the Heritage Foundation, repealing the death tax would add 180,000 additional small business jobs. The Tax Foundation found repeal would boost workers wages by half a percent and increase GDP by .58 percent over 10 years. A 2012 Joint Economic Committee found that the death tax has prevented $1.1 trillion in capital formation, which could have been used to increase employment and expand GDP. The death tax contributes a very small portion of federal revenues. The death tax currently accounts for less than half of one percent of federal revenue. There is a good argument that not collecting the death tax would lead to higher economic growth and thereby increase federal revenue from other taxes. Former undersecretary of the Treasury, Steve Entin, found that repealing the death tax would increase tax revenues by nearly $89 billion over 10 years using a more realistic, “dynamic” economic analysis. The death tax imposes burdensome compliance costs and forces family businesses to divert productive capital into large life insurance policies and expensive estate planning. The death tax falls particularly hard on minorities. African-Americans have just in the last generation started accumulating generational capital, but the death tax threatens to confiscate it. Death tax liabilities bankrupted the Chicago Defender – the oldest black-owned daily newspaper in the United States – and will reduce net African-American wealth by 13 percent, according to a study conducted by Boston College professors John Haven and Paul Schervish. According to a 2004 Impacto Group poll, 50 percent of Hispanic business owners know someone who sold their business to pay the death tax and a quarter expect to sell their business because of the death tax. A super-majority of likely voters support eliminating the death tax. Poll after poll has indicated that a super-majority of likely voters support repealing the death tax. Typically, two-thirds of likely voters support full and permanent repeal of the death tax. People instinctively feel that the death tax is not fair. The death tax is unfair. It makes no sense to require grieving families to pay a confiscatory tax on their loved one’s nest egg. Often, this tax is paid by selling family assets like farms and businesses. Other times, employees of the family business must be laid off and payrolls slashed. No one should be punished for fulfilling the American dream.